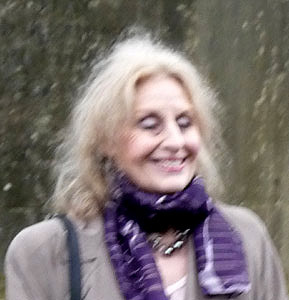 The ceremony was arranged for 3 pm at the memorial. Despite torrential rain earlier, the weather improved and the rain stopped just before the service began. While everybody taking part took their places, the choir of St Andrews Church of England Primary School sang "Danny Boy". 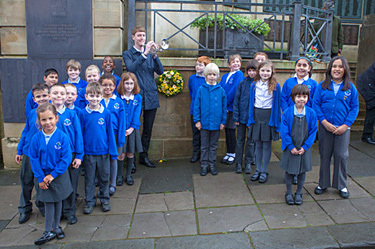 He reminded those present that the original St Andrew's Church had been destroyed during the bombing of Bath, and it was a particular pleasure to welcome the Choir of St Andrew's Church of England Primary School who would be singing as part of the service. A trumpeter from the Bath Spa Band played The Last Post. 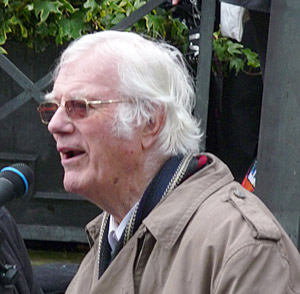 Harry Hemming told the story of Joe Marsh. Joe's house used to be where St Andrews Junior school now is. 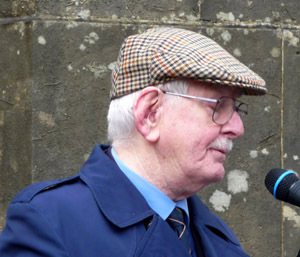 In November 2001, Joe was one of the presenters telling the story of what happened to him and his family and his home during the bombing of Bath. This presentation was recorded and is part of the collection on the "Personal Memories" DVD featured on the Videos and DVDs page. Harry re-told Joe's story for this service. 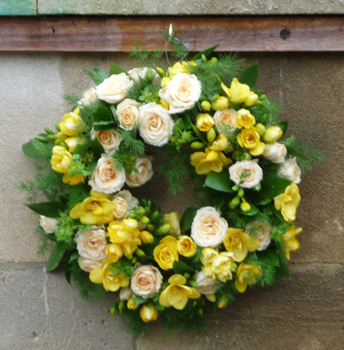 The wreath was kindly donated by St Andrews Church of England Primary School. 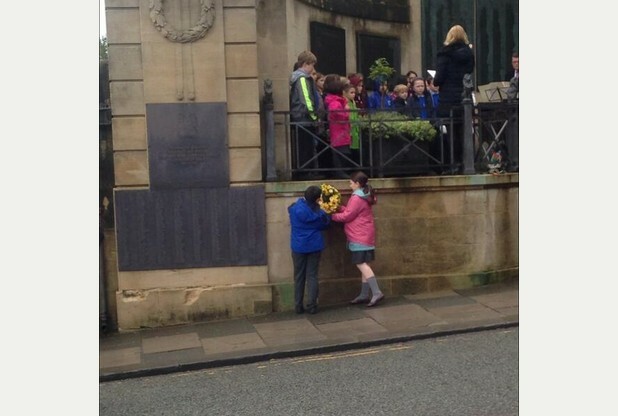 Bryan Vowles extended thanks to The Choir of St Andrews Church of England Primary School for their musical contributions, and to the School for the donation of the wreath. He also thanked those who had attended this year's service and gave the date (26 April 2015) of next year's event. 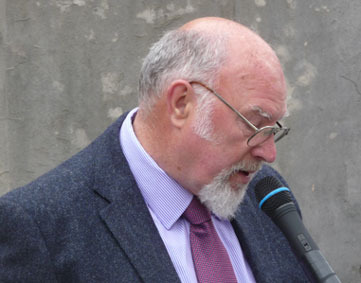 He also warned those present that the bomb-scarred former Labour Exchange was under threat from the council who had development plans for the building. The St Andrews Choir finished the event with a song which was popular during the war. The Choir then posed with the trumpeter for a photograph in front of the wreath. 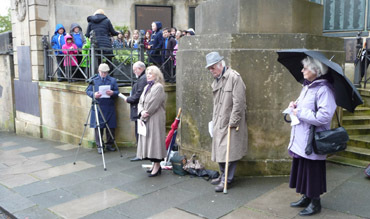 People braved the rain to pay their respects to Bath Blitz victims, on the 72nd anniversary of the bombings. Some 417 Bathonians lost their lives in April 1942 after a three day assault on the city by the German Luftwaffe. The rain held off just long enough for the short service at the war memorial at Victoria Park earlier this afternoon, which was organised by the Bath Blitz Memorial Project. This year's service featured the choir of St Andrew's Primary School. 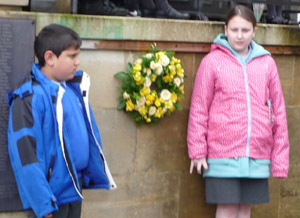 Two pupils from the school laid a wreath, donated by the school, in memory of the victims. 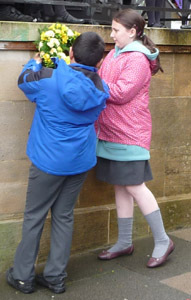 The service focused on the story of Joe Marsh, whose house was where St Andrew's School now stands. Mr Marsh, who has now passed away, wrote down his story to be shared at the memorial service. He said: "On the first night of the Bath Blitz we had windows broken. On the second day, as darkness came, more planes came over and this time they dropped incendiary bombs". Mr Marsh was 16 years old in 1942. His family of 11 lived in a three-storey terraced house at Northampton Buildings. He describes how his brother went to put out a fire in the middle of the road, when he heard the sound of a large bomb falling. He continued: "The shrieking and the high-pitched whistle of the falling bomb suddenly stopped and all went silent. Then the floor of the front passageway where we were laying seemed to go up and down. It shook terribly. After that came the blast. Six people were killed by that one bomb". 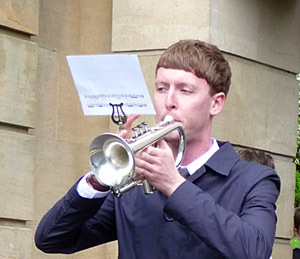 The Last Post, performed by trumpeter Ben Jose of the Bath Spa brass band, was played prior to a minute's silence in memory of the 417 Bath citizens killed during the attack. 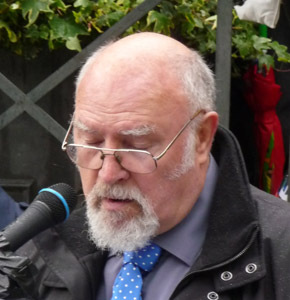 Bath Blitz Memorial Project chairman Brian Vowles said: "St Andrew's Church was totally destroyed in the attack, and it is very fitting that the school that bears the name of the church is represented here today." Next year's memorial service will take place on Sunday, April 26.